One year ago, SEMI’s World Fab Forecast report called for fab equipment spending growth of 8 percent for 2018. If that forecast materializes, the industry will enjoy its third consecutive growth year – a run the semiconductor industry hasn’t seen since the mid-1990s. Little wonder, then, that the record pace of investments through 2017 stoked speculation that traditional industry cycles could be changing. Historically, spending sees one- to two-years of growth followed by a downturn of roughly equal duration, setting up 2019 for a fab spending slowdown if historical norms play out. 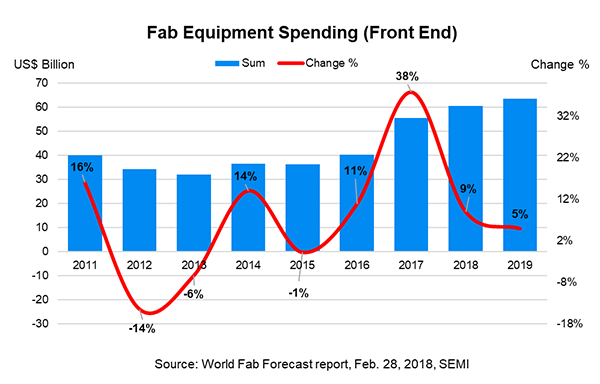 However, now, one year later, SEMI’s World Fab Forecast data point to an improbable eye-watering fourth consecutive year of fab equipment spending growth to the tune of 5 percent. See figure 1. With last year’s strong memory pricing, Samsung made immense investments that will play out this year and perhaps next. Fab investments in China are on the rise, with new projects underway. Various market scenarios for known fab projects point to growth of as low as 2 percent in 2019 but there is no current indication of negative change rates. SEMI predicts Samsung will lead the pack in fab equipment spending in both 2018 and 2019, even though it will invest less each year than in 2017. By contrast, China will dramatically increase its year-over-year (YOY) fab equipment spending for the next two years – by 57 percent in 2018 and 60 percent in 2019 – to support fab projects from both overseas and domestic companies. The China spending surge will thrust it past Korea as the top spending region in 2019. As expected, China’s fab equipment spending is increasing as companies there begin to equip fabs constructed earlier in this cycle. The record 12 volume fabs that started construction in China in 2017 will begin equipping this year and next. See figure 2. Non-Chinese companies account for most of the fab equipment investment in China, but in 2019 Chinese-owned companies are expected to ramp up fabs, increasing their share of spending in China from 33 percent in 2017 to 45 percent in 2019. China is the main driver of fab equipment spending growth in 2018 and 2019, fueling a fourth consecutive year of spending growth in 2019 absent a major change in its plans. 3D NAND will lead product sector spending with US$16 billion (3 percent) in 2018 and US$17 billion (3 percent) in 2019. DRAM will see robust growth of US$14 billion (26 percent) in 2018 but is expected to fall to US$12 billion (-14 percent) in 2019. Foundries will increase equipment spending to US$17 billion (2 percent) in 2018 and to US$22 billion (26 percent) in 2019 mainly to support 7nm investments and ramp of new capacity. More details are available in the SEMI World Fab Forecast published February 28, 2018. The forecast covers quarterly data (spending, capacity, technology nodes, wafer sizes, and product types) per fab through 2019.